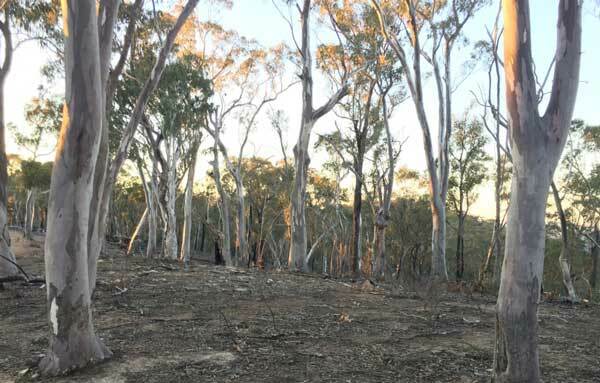 "Last week I spent time checking and vetting the NSW Championships course in the Abercrombie River National Park, south-west of Oberon. It’s an area previously used for rogaining and well worth a revisit. Michael Watts and Mike Hotchkis set the 2010 Champs with the Hash House on the eastern edge of the Park. After enduring regular showers, sleet and snow I optimistically named it the High’n’Dry Rogaine and for the event we had perfect, sunny, sparkling conditions. You can review the event here. The 2001 NavShield was also held in Abercrombie NP, with the base camp on the western side of the Park. Results from 2001 are here. The Abercrombie National Park is pretty big, about 190 km2, ranging in altitude from 600 to 1100 metres. It’s steep, wooded country with the Abercrombie and Retreat Rivers creating some big hills and vistas. After my few days in the Park last week I can confirm that Spring is in the air, the flowers are starting to bloom, it didn’t rain, and there is better flow in the creeks. My first day included a 6½-hour off-track stint … partly because of several circles looking for a non-existent control, but more due to my slowness and enjoyment of the environment. We’ve added some pics of the area here. It’s a fairly long drive to get to the Hash House - 3½ hours from the Sydney CBD, a bit less from Canberra – but the central highlands are among the best rogaining areas in NSW. Perhaps that’s why six of our last ten Championships have been in the Western Blue Mountains. If you drive be aware of kangaroos and wombats. The road-kill between Oberon and Hartley Vale is very sad, probably increased by the better grass on the roadside. Consider our bus option, connecting to the train at Lithgow. The Champs are a great excuse to explore a new area, enjoy the camping, the victuals and ambience. Enter the 24-hour and take your time to wander the course nearer to the hash house, while leaving the far side to our extreme athletes and expeditioners. I hope to see you at the Abercrombie Silent Retreat" Trevor Gollan. 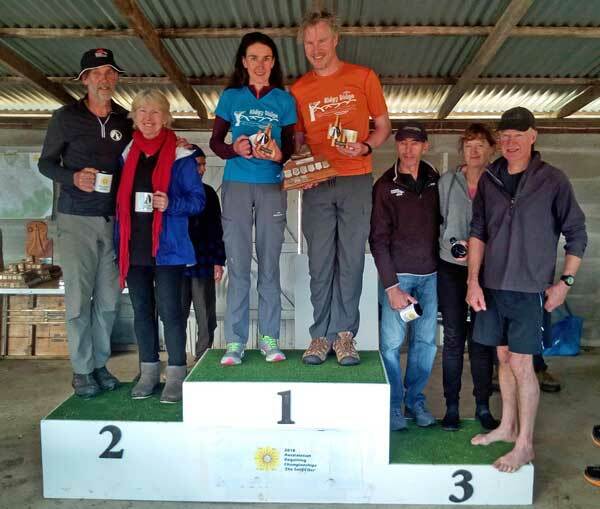 Lake Macquarie 12/6hr – Saturday 18th August – Results Available Now! 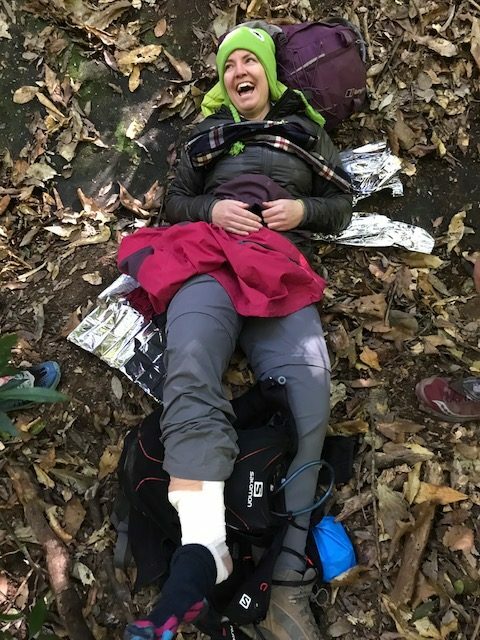 Our most recent event in NSW was the rogaine + trail run in the Watagan Mountains where over 110 teams took on the challenging but beautiful terrain of Olney State Forest. Shout out to overall winners of the 6hr Keelan Birch and Glenn Horrocks with 1750 points, over 80% of the score of the top 12hr team, Jason Holland and Andrew Powell, and a higher score than all but 2 other 12hr teams. Also shout out goes to our two 30km trail run teams, both of whom managed to grab some extra CPs along the way! Commiserations and best wishes to Renae Martin who broke three bones in her ankle early in the event. In true rogainer style she managed to keep smiling for the camera. You can see pics, and wish her well, on our Forum blog. ARC 2018 – 25-26th August Results, Splits, Flybys & Photos Available Now! 37 competitors from NSW lined up at the Australasian Rogaining Championships in the Gympie region of South East Queensland for the “SunSEQer” Australasian 24hr Rogaining Championships. It was a truly 4-season event, going from hot and dry at the start to turn cold and wet at 2am and failed to let up until the conclusion of the event. The good news is despite a much more open, less steep and larger 1:40,000 scale map, NSW won the interstate competition (awarded for podium finishes for categories). To get a better picture of what an ARC involves (and a 24hr event in general), have a look at my blog post on the forum here. Who’s up for 24? It doesn’t have to be that hard. It’s that time of year again that a 24 hour rogaine is just around the corner, and I am reminded of the committee’s discussion last year about why we receive relatively few entries to “traditional” 24hr rogaines in comparison to our shorter events. We all know the reasons: time, sanity, fatigue, inexperience can make a 24hr rogaine harder to commit to. But have a read here of why you must put a 24hr rogaine on your To Do List because it is not for nothing that there is a significant number of dedicated souls who turn up to these events year after year! NSW Rogaining to host a Sydney Summer Series event. Are you a rogainer hooked on the orienteering Sydney Summer Series? The 26-event program for 2018-2019 is now available. Or if you haven't tried an event, look at the program and see if there are any near where you live or work. The Sydney Summer Series comprises 45 min individual orienteering score events (i.e. micro-rogaines) on Wednesday evenings over summer, scattered over Sydney (parklands, bushland and streets). It a great way to practice navigation skills, and our Rogainers that participate do pretty well. Excitingly this year NSW Rogaining is hosting a SSS event on Wednesday 14th November, just before the Socialgaine. So we are forming an event team. Roles include: updating the base map, setting, vetting, and on the day help such as hanging controls, handing out maps and collecting monies at the registration desk, coordinating the results computer and collecting flags. If you would like to help out, please contact Gill Fowler [email protected], or fill out the volunteer form on the website. 2018 is not done yet with 2 great events remaining. We still need helpers to get these over the line, specifically help on the day and that special type of person that can tow one of the trailers to and from the event. Keep an eye on the Volunteers Register for the blank spaces. Volunteering at a rogaine is a great way to meet new people and pick up some new skills. Our sport relies on your contributions to keep the great events coming.